Pack your bags! Explore instructional design and learning trends for 2018 in this infographic. They say traveling is the most basic form of learning, but learning can be a journey as well. Here at SweetRush, we don’t see learning as a one-time event, but as a continuous process that happens over time, through different means. Now, buckle up and take a trip with us. 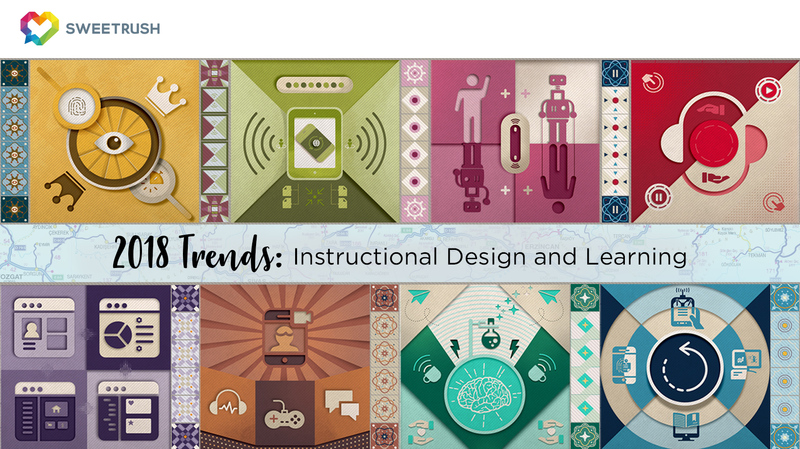 Our goal with this infographic is to highlight specific instructional design and learning trends for which we’ll likely see growing demand or interest this year. But none of these trends exist in a vacuum, and the most successful organizations will consider how to best use them in an integrated, holistic way. Rather than viewing learning as a one-time event, consider that learning is a process that happens over time, in formal, informal and self-directed ways. This approach invites us to “weave a tapestry” of learning experiences, which might include e-learning, classroom training, feedback, and coaching, informed by data analytics and measurement. We predict that Chief Learning Officers around the globe will begin to embrace that strategic vision. Your journey isn’t over yet! Be sure to check out the full article, 2018 Instructional Design Trends and Learning Trends: The Journey Of Learning. You can never go wrong when your instructional design/eLearning/Online Educating foundation is based on a solid theoretical foundation. We know that the eLearning Theory (Mayer, Moreno, and Sweller); Cognitive Theory of Multimedia Learning (Mayer); Cognitive Load Theory (Sweller); Discovery Learning (Bruner); Information Processing Theory (Lockhart, Shriffin, Rumelhart, McClelland & Bransford). How do adult learners process information, the quantity at which they will absorb it and best practices in ways that stimulate, ignite and transform their learning are all connected to the consumption of theory by educators, instructional designers,eLearning educators to impact the adult learners educational absorption space for the long term.